The list of stars that prefer a unique coloured gem stone in their engagement ring instead of a diamond is long. Amongst them are some of the biggest style icons of modern times, like The Duchess of Cambridge and First Lady Jackie Kennedy. This popularity aside, coloured gemstone engagement rings are still very rare. We probably have to blame Archduke Maximilian of Austria, who was the first (as far as historians know) to give his beloved Mary an engagement ring, set with small diamonds in the shape of an “M” in the 15th century. Looking back in history, we’ll find that coloured gems have always dominated the jewellery sector. Only their size and colour determined their value. The modern process of cutting gems today was developed throughout the following centuries. Diamonds were considered just non-fluorescent stones until then. It was only in the 18th century that the brilliant-cut was invented and diamonds began their triumphal march. But it was probably the mining company De Beers that dealt rings made of precious stones the deathblow when the company created the slogan ‘A Diamond is Forever’ in 1947 and linked it to the promise of eternal love. A dazzling coloured stone like a Ceylonese Sapphire can add a royal and breath-taking touch to your engagement ring. Likewise the rare and precious Paraiba tourmaline with its neon, electric glow make for an exquisite gemstone engagement ring. The blue purpled Tanzanite for example is only found in the foothills of Mount Kilimanjaro and the Red Beryl is only found in Utah. 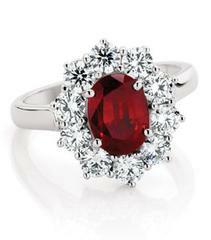 But even the more common gems like rubies and sapphires are varieties of the rare mineral corundum. Whilst cut is the most critical factor in determining the quality of a diamond, it is the purity and colour when it comes to the quality and value of a precious coloured stone. Still need convincing that a coloured gem will make a perfect engagement ring? Coloured gems come in all the colours of the rainbow giving you more opportunities in terms of design and to create a unique ring that really reflects your individuality.